Looking for the best GPU in the market today? Why do you need to focus on GPUs suddenly when all along PC makers have been emphasizing on RAM, CPU and storage options as the deciding factors on the performance of a gaming PC? Well, the truth of the matter is that GPUs have remained the most underrated element of computers that can significantly impact the overall user experience. So, whether you are building a gaming PC from scratch, upgrading an existing one or choosing a pre-built laptop, it is crucial to pay attention to the graphics solution you are signing up for. This is not to say that it is all right to compromise on the CPU or RAM or other key specifications of a device in favor of a graphics card but that it is essential to be mindful of a GPU’s capabilities in a modern gaming computer, as it influences the decoding, encoding, and display of video content in 2D as well as 3D. Of late, graphics cards have started to emerge out of the shadow and enter the mainstream of discussions around computer specifications. This is largely due to the overwhelming demand for graphics cards, thanks to the ever-growing community of avid gamers and more recently the applications of GPUs in cryptocurrency mining. So, the graphics cards market is riddled with a bit of a conundrum right now. On the one hand, you have more and more manufacturers coming out with impressively powerful GPUs, and on the other, the demand keeps peaking. The Graphics card’s model number isn’t some random compilation of alphabets and numbers but a representation of the type of processor, clock rates, and memory bandwidth. In that sense, the model number is one of the key indicators of the performance potential of a graphics card. Obviously, the higher a model ranks in terms of these specifications, the better its performance will be. More often than not, higher model GPU from a lesser known brand can deliver a better performance than a flashy one from a leading brand. The thumb rule is to choose for the highest-tier model fitting your budget. For some reason, we are fixated on the RAM space of our gaming PCs. When it comes to graphics cards, the RAM size should be the least prioritized in the order of consideration. Unless you are going to use your graphics card for insanely high-resolution tasks such as running 4K video on three monitors, the RAM size remains inconsequential. Any high-end model will always have enough RAM to support the tasks it is designed to perform. Instead, your focus should be on the memory bandwidth. Here, for instance, a GDDR5 memory bandwidth is better equipped to tide over performance bottlenecks than a DDR3 bandwidth. If you have to pick between a graphics card with 4GB of DDR3 memory and one with 1GB of GDDR5 memory, the latter makes an undisputedly better choice. This is especially important if you are going to use a graphics card to upgrade an existing device. The graphics card is undoubtedly a crucial factor in your device’s performance but it is not the sole determining factor. Picking a top end graphics card may prove counter-productive if you run it on a PC running an old dual-core processor. In such cases, it is best to either upgrade both the processor and the GPU or settle for a mid-range graphics card that can complement the performance of your existing CPU. 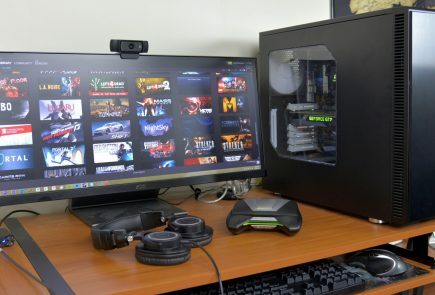 Nvidia and AMD, both leading graphics card manufacturers, offer users the option to rev up their device’s performance by linking multiple graphics cards. At the face of it, it sounds like a great proposition, except linking multiple GPUs isn’t as easy and seamless as it is made out to be. First of all, it helps to be clear about the fact that supplementing a graphics card with a second one does not improve the performance two-fold. It offers an improvement in the range of 25-50 percent. The odds keep diminishing as you add more GPUs into the configuration. In addition to this, using multiple graphics cards can lead to issues such as micro-stuttering, excessive noise generation and power consumption, incompatibilities and more. Multiple graphics cards can come in hand in certain situations such as when running multiple-monitor resolutions. However, more often than not, these prove to be an overkill. High-end graphics card are power guzzling devices that generate an insane amount of heat. Therefore, having a reliable system to keep your GPU cool is critical to keep your computer functioning. The absence of a cooling system can literally fry a graphics card, so having one is non-negotiable. The important thing is to assess which type of cooler would best suit your graphics card, overall machine built and usage pattern. Your options are limited to reference, aftermarket or custom cooler. Of these, reference coolers are low-cost options that happen to be noisier. Customer coolers that can be procured at an additional cost are usually considered to be better disposed to keep GPU temperatures under control as compared to reference coolers, and also happen to be quieter. The catch is that custom coolers can work effectively only if your system has inbuilt heat dump ability. So the choice of cooling option remains subjective but having one in place is mandatory. This is definitely a front-runner in this category as it offers the maximum bang for the buck. 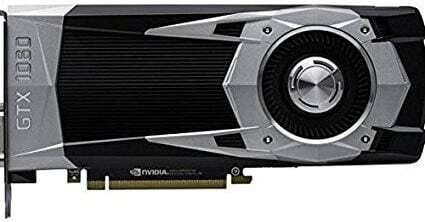 With 1280 stream processors, 1506MHz core clock, 6GB GDDR5 memory, 8Gbps memory clock: 8Gbps, the Nvidia GeForce GTX 1060 is by far the best inline graphics card out there capable of a beastly performance and sheer value. 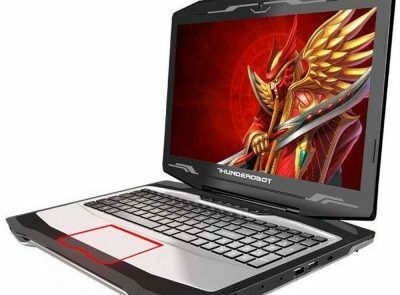 It offers you a full HD viewing experience in the 1080p resolution that can be enhanced to 1440p with a bit of over-clocking and even supports 4K gaming. There is no option to link it with other cards though. With its kind of performance, you wouldn’t need to anyway. This is the ultimate graphics card built exclusively for gaming with a Twin Frozr VI. The heat transferring ability, smooth heat pipes and the option to stop the fan when the load is less, makes it a great addition to any gaming rig. It is also a supremely silent operator, which is definitely an added bonus given how noisy graphics cards can be. 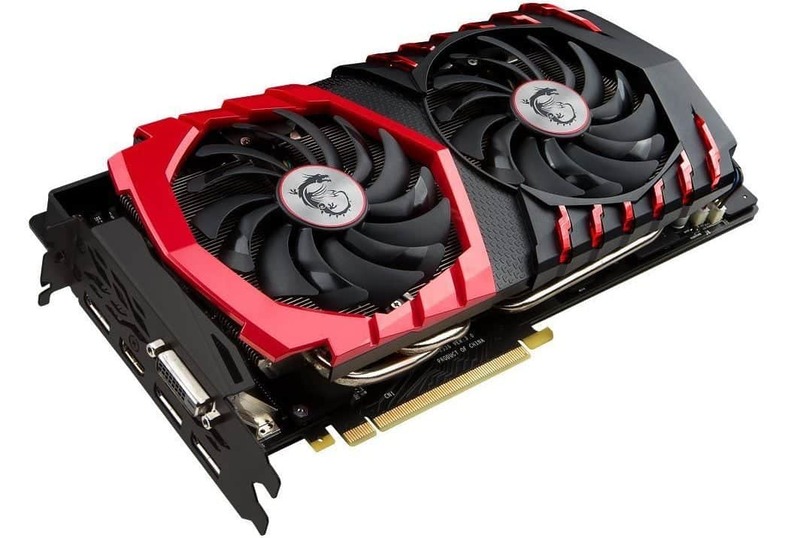 The sturdy built and advanced specifications of this graphics card make it a strong and lasting choice that will see you through years of gaming. This AMD offering is the clear winner in the segment of graphics cards with Full HD capabilities and has successfully outdone the Nvidia GTX 1070 in most benchmarks. 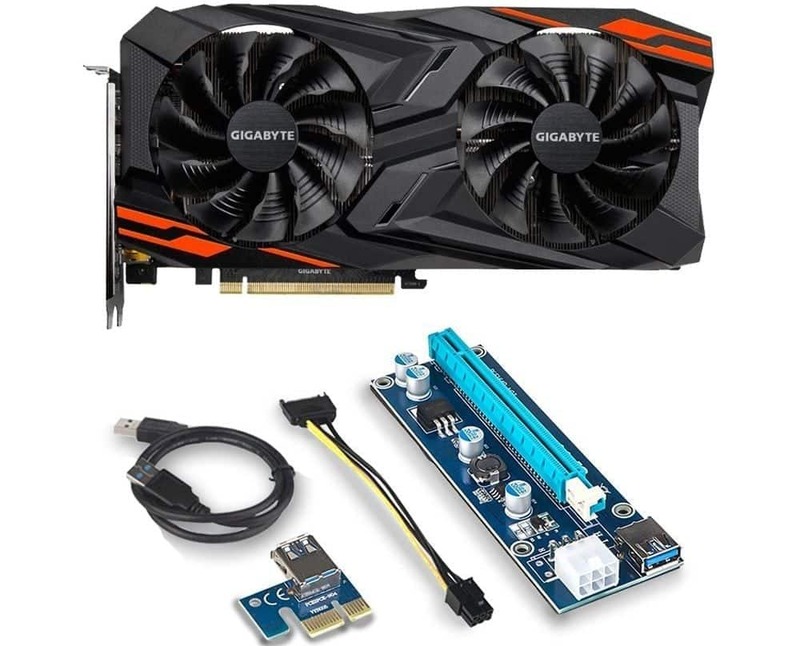 The Full HD capabilities of this graphics card can be a bit of an overkill for most users, however, these come in real handy when working with 144-to-240hz monitors. If you are in the gaming world for the long haul, this is a great choice for future-proofing your gaming requirements. Capable of delivering a 1440p Full HD display, the AMD Radeon RX Vega 56 is nothing short of a delight. The only dampener is that it is currently selling at a premium price, owing to its high demand among crypto miners. The ROG Strix GTX 1070 Ti from Asus is built to deliver a great whack of power. It is a GPU that ensures reliability and premium quality. As with all other Asus graphics cards being produced right now, the ROG Strix GTX 1070 Ti also uses the industry-exclusive Auto-Extreme Technology with a completely automated production process. 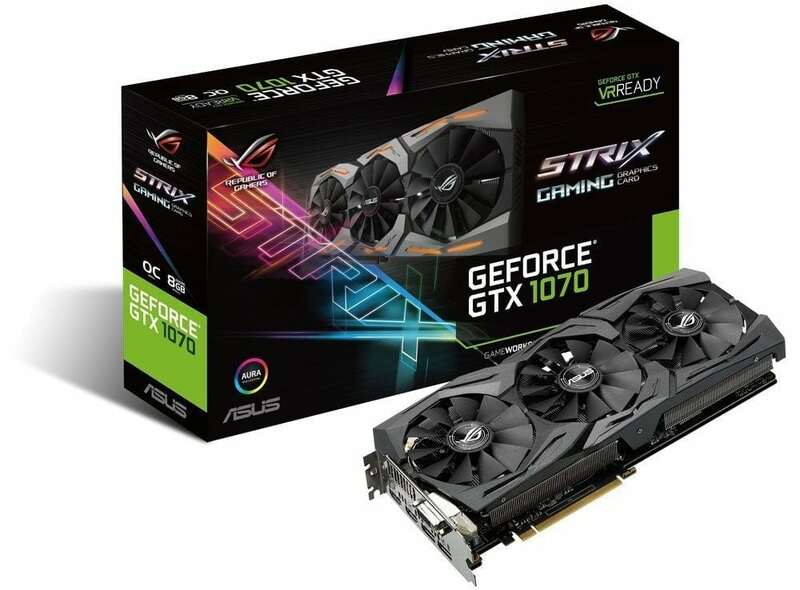 The cutting-edge technology has earned much praise and found favor amongst tech experts for its ability to enhance GPUs’ performance and longevity, and the ROG Strix GTX 1070 delivers on the promise 100 percent. You can use this graphics card to push your device’s performance up to 1759 MHz with just a single click and a few tweaks.